Long before Catalina Island became the Island of Romance, it was a destination for families eager to reconnect and spend quality time exploring somewhere new. Since the turn of the last century, this Southern California vacation destination has brought families closer together and created childhood memories that last a lifetime. Combining that heritage of family fun with all-new activities and experiences for all ages, Catalina Island has become Kidalina Island. From toothless grins on infant faces to wide smiles that replace normally snide teen scowls, this island paradise will thrill the entire family. The island’s protected leeward beaches are the perfect spot for toddlers on Catalina, who happily spend hours playing in the sand and splashing in the shallows – just don’t forget the sunscreen. Older children will want to explore beyond the shore and there are myriad ways to do just that. Snorkeling is appropriate for any child who is comfortable swimming. Several companies rent gear, including wetsuits for the cooler seasons. Try a guided experience to get the most out of your time in the water. Older children and teens can adventure even deeper, scuba diving in the Casino Dive Park, the first park in the nation dedicated to scuba. If your kids aren’t ready to submerge, activities abound on top of the water as well. Stand-up paddleboards, kayaks and pedal boats can all be rented for a topside adventure or check out the many boat tours and charters available that bring you closer to dolphins, whales, big game fish and more. While the island’s crystal clear waters beckon, water activities are far from the only thing to do here. Several parks and upgraded playgrounds provide a range of activities for younger kids on Catalina – one of our favorites is the new Knabe Park pirate-themed playscape overlooking Avalon Harbor, perfect for preschool-aged buccaneers. Older children won’t be able to resist all the adventures available nearby. 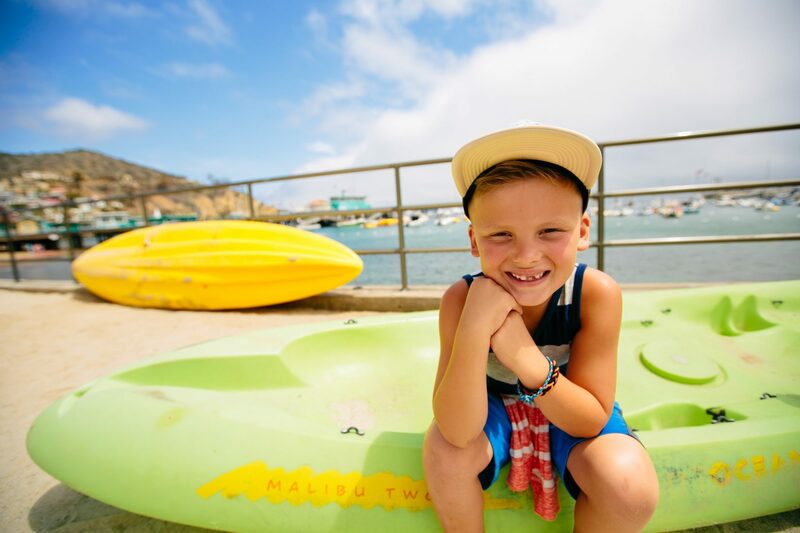 Kids age six and up will never forget parasailing and those over five can race over Descanso Canyon on the Catalina Island Zipline or challenge themselves on the climbing wall. Ranging farther afield will bring you and your family closer – and closer to nature. Protected in perpetuity by the Catalina Island Conservancy, Santa Catalina offers rugged terrain and unique wildlife, all of which are best experienced on a guided tour, available in both high-adventure four-wheel drive and more genteel bus and van options. Catalina Island offers a wide range of dining options, sure to please even the pickiest palate. Pizza and burgers nearly always make kids cheer and – befitting Avalon’s seaside locale – you’ll find great fish and chips both indoors and out. However, chefs on Catalina hardly limit themselves to traditional kid offerings and you and your family won’t have to either. You’ll discover great seafood, pasta, steaks and more in eateries ranging from beachside bistros to refined restaurants. Spring Fest – You’ll find food and fun for the whole family at Springfest, a beachfront celebration scheduled for April 13 from 5 to 9 p.m.
Catalina Spring Art Fair – Kids and adults alike will enjoy discovering and creating art along Crescent Avenue from April 14 to 16. Catalina Concerts – Scheduled throughout the summer and fall, the Catalina Concert Series has become a family tradition on many Catalina vacations. The next concert is scheduled for April 22. Catalina Island’s long history of family fun can be discovered at several locations around town. For a deeper look at that history, visit the Catalina Island Museum – open daily and kids under 15 get in free. Or take yourself and your family on a trip to the Avalon Golf Gardens. This 18-hole mini golf course has entertained generations of Catalina Island visitors and residents alike for more than 40 years. With its park-like setting and award-winning design, Golf Gardens offers a nostalgic retreat, where family fun – and a little friendly competition – becomes cherished family memories. No matter what you and your family decide to do on Catalina Island, one trip won’t be enough. Kidalina will keep calling you back, making treasured family memories for years to come.